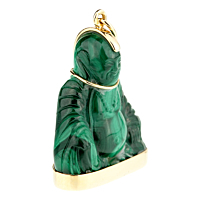 This is a magnificent Cartier seated Buddha necklace that features a hard carved malachite figure of a seated Buddha that is wrapped in 18k yellow gold. 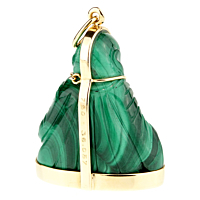 Distinctly delicate in its precise detail, the Cartier Buddha necklace is a worthy counterpart to your life. Pendant Dimensions 1.22" by .94"